A mineral supplement of organic origin containing unique natural substances (calcium, phosphorus, magnesium, manganese, silicone, and other trace elements) ensuring optimal joint and bone nutrition and optimal muscular function and optimal function of certain enzymatic systems. It contains an ideal mineral ratio for bone turnover. Add-on substances (vitamins D, C, and A, unsaturated fatty acids, collagen) increase utility in the body. Suitable for all animal species, particularly for growing young. - After bone surgeries and fractures for bone mineralisation [Kingvet, Renovet, Imunovet]. - Prevention of and regeneration from rachitis of the young and softening of the bones in adult animals [Gynevet, Kingvet]. - Supports the growth of horn and improves its quality (nails, hooves, horns, claws) [Gynevet]. - Hair recovery during molting and regeneration of damaged hair [Gynevet]. - For softening of tortoiseshells, preparation of reptiles for shedding of skin [Gynevet, Omegavet]. - During molting or for recovery of damaged feathers in birds [Gynevet]. - Inflammations of the joints, joint capsules, tendons and their insertions [Kingvet]. - Add-on product for allergic reactions, anaphylactic shock, insect bites and snakebites [Cytovet administered to the wound]. - Production of eggs and eggshells in birds and reptiles [Gynevet, Kingvet]. - Add-on product for muscular function [Kingvet]. In 1 capsule: soy oil, gelatine – capsule, cuttlefish bone powder (100mg), glycerine – thickener, collagen (52.5mg), fish oil (35mg), water, stinging nettle extract (15 mg), hip rose extract (10mg), manganic sulphate (3mg), lecithin – emulsifier, beeswax. Animals over 50kg: 1 to 2 capsules for every 50kg of weight twice a day. Where problems with intake are experienced, it is necessary to soften the capsule in warm water, cut it partially or prick it and press the contents out, ideally into foodstuff. In my veterinary consultancy, I often treat older dogs suffering from arthrotic joints. 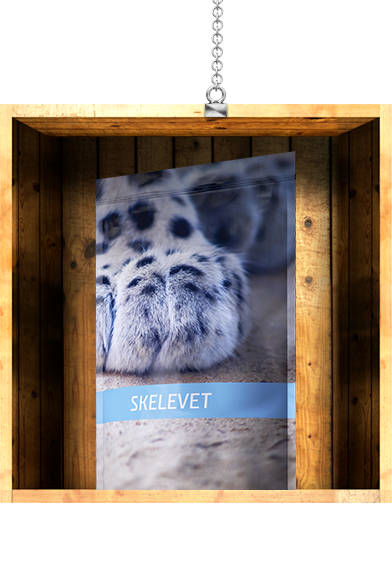 Skelevet helps to significantly slow down the degenerative joint alterations and hence prolong the active life of movement.